Basically, the idea was to import the Swords & Glory map - or rather bits of it as the full scanned image is over 70 Meg, IIRC - into AutoCAD. Having done that with a rectangle covering the bulk of Tsolyánu, I then scaled it to meters as accurately as possible. Keep in mind that I had to use the hexes on the map as the basis for the scaling, judging the centerline of the hex edges as best I could. Looking back, I see that I got as far as "part 21" before I paused. I was attempting to determine the nature of the Mssúma river by researching Real World rivers: the Nile, Mississippi, Ganges, Indus and Brahmaputra rivers. All great rivers, each different and yet with many similarities. Of course, almost all the major rivers on the planet have been altered by mankind, with dams and similar works of "civilization". In fact, I understand there is only a single Siberian river that is as yet untouched! So to do my research I had to look to historical sources to find out what the rivers were like in their natural state. 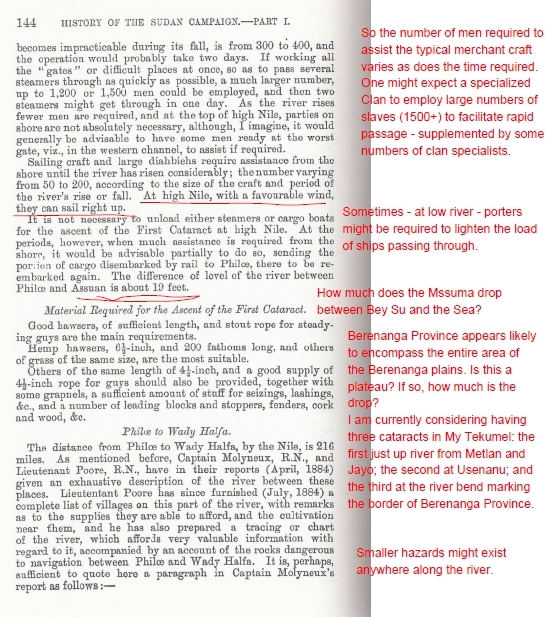 I was lucky in that I have the reprint of the Official History of the Sudan Expedition 1884-1885, which in Appendix O describes a reconnaissance of a large part of the river. So that is where I left off. I haven't actually stopped, I just haven't been blogging about it as much. I've been speculating about cataracts on the Mssúma river - which it seems to me it must obviously have - or even falls. I believe that there is only a single waterfall mentioned in any of the writings about Tékumel, and that is way up in N'lússa! Surely many hundreds (or thousands) of others must exist! I've been wondering how the Mssúma river transitions off the Beranánga Plains: are the plains a plateau or does the land slope more gradually? Are there falls at some point? I've also been thinking about Usenánu and that tributary river which seems to have two names. And about the Mssúma Delta, which is barely indicated on the Swords and Glory map but which we are told exists. And, from my research on the Mississippi, I am wondering about what other courses the Mssúma river may have taken through the ages. And that leads me back to the Flats of Tsechélnu, which this post was supposed to be about, but which I now think needs a thread of its own! Re. Mssuma river course changes. There are river course changes due to seasonal flooding and erosion, and then major changes due to things like earthquakes. The Indus river changed its course as a result of an earthquake, changing where it flows into the Indian Ocean. The former delta became a desert IIRC. I am so happy to hear this project still has legs on it!! Does the Mssuma "need" rapids and waterfalls? It's only, what, 1500? 1600km? long on the plains -- more on the order of the Don or the Tigris than big ones like the Mississippi or the Indus, isn't it? The Don and the Tigris might be close in length, but have much smaller watersheds: 442,000 sq km for the Don, and only 35,600 km2 for the Tigris. I was estimating the Mssuma watershed as being much larger: 1,505,289.25 sq km. The Mississippi River: 2,981,076 sq km. No argument about lots of rivers having (or having had) rapids, as you describe! As far as watershed size goes, that is an interesting factor, but does it in fact help predict (in the real world) whether a given river has rapids/waterfalls/non-navigable parts? Is considering it actually useful for this purpose? I'm really struck by the (apparent?) discontinuity between the Mssuma's relatively short length compared to the three big rivers you compare its catchment area to. Just doing an eyeball survey of Wikipedia, of the 23 rivers falling between 2000-2500km in length, only one has a drainage basin over a million square kilometers (the Orinoco, at just 1.3mkm2). To me that suggests the Mssuma you've laid out is a real outlier compared to its Earthly peers. And it also suggests to me that I should actually go look at one of the maps and see how long the Mssuma is, instead of going off old & ingrained memories that could be total BS. In any case, I haven't read your Digitizing Tekumel posts for years (I think that shows?) and I'm going to remedy that real soon -- and definitely before I bloviate any more here! I don't know that watershed has anything to do with rapuds. I was just making a case for it being a Big river. My thinking with regards to the watershed was that it must drain from the mountains in the North, from the Kurt Hills in the North-west, and then less obvious places elsewhere. Some more-or-less arbitrary line south of the Kurt Hills. I placed ridges of higher ground between the Rananga and Eqonoyal (sp?) rivers - I guess your Tekumel will vary there! - and I have an idea that there are seasonal rivers that flow into the Desert of Eyagi, so I added a ridge along the line of the Mssuma on its Eastern side. Re. Desert of Eyagi I reckon there is a seasonal lake that forms with the rains. This comes from watching a show about a lake in Australia that forms in the wet season, attracting huge flocks of Pelicans IIRC. What do they feed on? Millions of tiny shrimp that spend the dry season dormant under the dirt. This gives the nomads a reason to be there. Nomads? Like Nayari! A nomad. They are in the encounter charts as well. So for the wet season they come South, then head back up through the Dry Bay of Sirsum (sp?) to pastures in the high mountains. As to rapids and falls, I think it makes things more interesting. More Real. I mean, read those description of the Nile I posted. How interesting and changeable the river is, or was. Re. Falls. I can only think of a single named instance, and that is on the N'lussa-Mu'ug border. So maybe there are no actual falls on the Mssuma, maybe cataracts only. Really I think it depends on how much does the land rise. Is it like India, where it doesn't rise very much at all until right at the edge of the Himalayas, where it shoots up dramatically. Even if this is the case, it could be that the Berananga Plains are a plateau and that there are one or more cataracts dropping the river down to the next level. I am postulating that maybe this extends to Usenanu where there are more cataracts. And then I place another set on the great bend further south. I assume there are lots if lesser river and streams. I doodled some at random on the drawing above. Another thing is the Mssuma Delta. 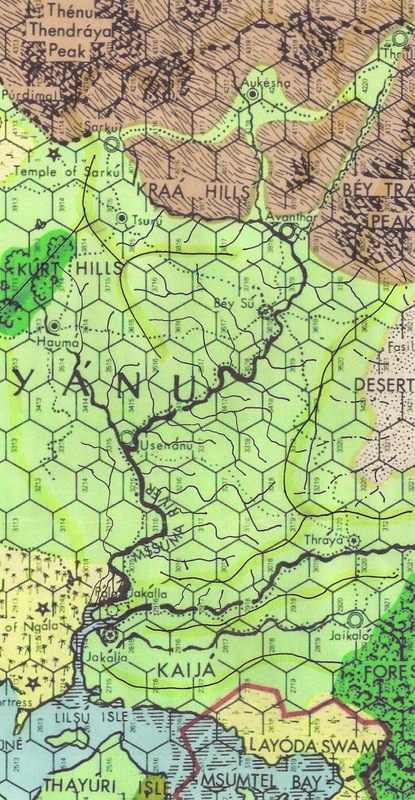 This is not really shown on the main maps but is mentioned in the green solo book (IIRC). Of course, it is a bit hard to place the action as things are placed in such vague/inaccurate positions on the large map. I mean, the Jakalla symbol isn't even on the coast! I did a check on the length of the Mssuma river, tracing a polyline down the length of river. It is only a rough estimate. I didn't follow all the minor bends exactly so it is probably a bit longer. Checking the properties of the line reveals the length to be 2,452,291.8998 m, or 2,452.29 km (approx. 1,843.83 tsan).